UPDATE: AOK published a rather long list of markets too. Check it out! Last year I did a round-up of Xmas markets around the Copenhagen area. I have done this again for 2009 for the LINK (Ladies International Network) newsletter and I’ve also received some great info on Christmas concerts from the LINK group. Here it is for those who love Christmas hygge. There is no place like Scandinavia during Christmastime. And although it’s often cold, rainy and/or snowy and dark, the city transforms into one of the coziest places on earth this time of year. Tasteful decorations are all around from huge red, light-filled hearts strung along the street lights, to warm-glowing candles in cafes, ice skating and beautiful displays in shop windows. There are also a host of traditions in Denmark that help put you in the Christmas spirit. One of my most cherished is going to Christmas markets. Handmade arts and crafts, including ingeniously designed house wares and other practical things are usually available. In addition, museums and specialty shops often arrange holiday exhibitions that are not to miss. I have found that information concerning these markets and exhibitions is often scattered about in many different places making it a little tricky to find out just when and where they take place. So, I compiled a list of the most popular markets below. For a more comprehensive list of markets around Copenhagen and across Denmark, visit Marketskalenderen.dk or http://www.markedskalenderen.dk/marked/julemarked.asp to view the whole schedule. 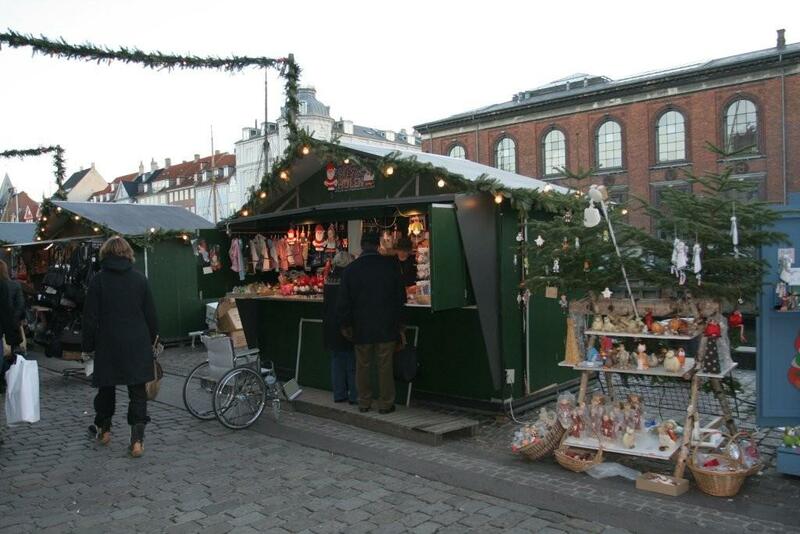 Visit Copenhagen has also published a Christmas round-up. If you’re willing to venture to Sweden: http://www.skane.com/cmarter/cmarter.asp?doc=152 or to the rest of Scandinavia check out the round-up at About.com. UPDATE: Annika Hipple from www.realscandinavia.com has tipped me off to her blog covering Xmas Markets here in Sweden. For those in the Gentofte area, there will be a Julestue at Skovrideren (restaurant complex across from the Aquarium on Jaeggesborg Alle) on Dec. 1 from 14:00 – 20:00. Besides the markets, most local churches hold performances of Christmas concerts every weekend until Christmas. You will quickly see that there is no shortage of things to do to enjoy the Christmas season. And don’t forget to sample some glögg (mulled wine), and æbleskiver, little round doughnuts dusted in powdered sugar and dipped in raspberry jam, while you shop! Closed 24 and 25 Dec.
What to expect: Stroll around Tivoli and sample the Danish Christmas treats ‘gløgg & æbleskiver’. Or visit one of the 20-odd restaurants and have a traditional Danish Christmas lunch with pickled herring, liver paté, meat balls and other Danish delights. Visit Nissekøbing and study the life of the Danish pixie or gnome (‘nisse’) in this grand display of mechanical puppets. You can also listen to the Nisse Band playing Christmas songs, enjoy the Tivoli Boys Guard Parade or meet Father Christmas/Santa Claus. Really, Christmas at Tivoli is not to be missed. Monday to Friday 11:00 – 18:00, Saturdays 10:00-17:00, Sundays 11:00 – 17:00. On Axeltorv in the old town of Elsinore, you can explore more than 30 small Christmas huts and shop for pottery and jewelry, jackets, mittens, hats, scarves, clogs and nisser. In the big tent you can taste sweets and other Christmas delights. The ice rink, the nostalgic ferris wheel from 1912 and the small carousel are open throughout the period. Celebrate Christmas Scandinavian style! Once again, the Swedish Church, 21 St Georges Road, Toorak, will hold its traditional and very popular Scandinavian Christmas Bazaar on the first weekend in December. A very popular annual tradition featuring many stalls with Swedish Christmas specialities, arts and crafts. In Gustavskyrkan. Open daily from 11am to 6pm, Fridays and Saturdays until 7pm. Along the quaint old canal off Kongens Nytorv, stalls offer samples of Danish Christmas specialities, decorations, gifts, candles and other examples or arts and crafts, which have been especially produced for the Christmas crowd. On weekdays from 5 to 6pm you may chance upon the ‘old watchman or town cryer’. There is also a Christmas market nearby at Havnegade near the Custom House however the dates for this market have not been published yet. The Meat Packing District will hold its first Christmas market making Vesterbro the very first to hold a delicatessen and design Christmas Market in Copenhagen, with a fine mixture of food, arts and crafts and design stalls. With colored lights, open fires in former oil barrels, a horse and wagon and other exciting experiences for children and adults alike. Open M-F from 14:00-20:00 and 12:00-20:00 on Sat. and Sun. Also open from 12:00-18:00 on Dec. 19. The alternative Christmas market in the Grey (Grå) Hall in the – hippie district Christiana has all kinds of crafts and resembles a Turkish bazaar. About 45 minutes north of Copenhagen the Fuglebjergaard organic farm has a Christmas market offering organic products for sale from their own shops, cafes, bakery and brewery as well as Christmas decorations, homemade specialties. new theme each year. The tradition began in 1963 and is very popular. The theme of the 2006 tables is Christmas in the Metropolis of the World and will be displayed from Friday, 24 November until the end of December. The open-air museum north of Copenhagen is a journey through the past 200 years of Christmas celebrations and preparations. Experience Christmas as it was – in the good old days with traditional decorations and Christmas trees. Sing and dance around a Christmas tree, drink Glögg and eat æbleskiver. Visit 15 designers selling unique products, everything from jewelry, clothing, lamps, calendars, Christmas decorations with humor and much, much more. Located on H.C. Oerstedvej 18. Stjernestunder, Helle Holst Design will host its 7th consecutive year Christmas market at Stjernestunder (Fyrrehøj 3 in Hellerup). You will find hand-braided Danish Christmas decorations, beautiful French temptations, Japanese towels and much more. Here are a few more places that usually have Christmas activities. Look these up online for more details, or if you have questions, feel free to e-mail me at laura@stadler.com. I was glad to discover your blog through a Google alert. I write a blog called Real Scandinavia (www.realscandinavia.com) and wrote a post about Christmas markets in Sweden earlier this month. I just wrote a short post about your Copenhagen Christmas market roundup with a link to your blog. Maybe we can generate some traffic for each other among people with an interest in Scandinavia. If you add me to your blogroll, I’ll do the same to you. I am in Copenhagen on the 25th Dec on business and wondered if there is anything at all open?! Are there any markets open or will there be any events that I can go and see? It could be a very boring day otherwise?! Hi there, from what I can see a number of museums are open on the 25th, with many still having exhibitions related to the climate for the Summit. Also, you may try a service called, “Dine with the Danes,” and could get lucky to enjoy a traditional “2nd Christmas day” lunch — Christmas is traditionally celebrated on the 24th, so there should be some places open. http://www.dinewiththedanes.dk/main/default.asp — you can also sign up for a list of events on the dates you will be here at http://www.visitcopenhagen.com/tourist/plan_and_book — as far as I know many restaurants and bars should be open on the 25th. Tadzio Müller, spokeperson for Climate Justice Action, arrested shortly after a press conference given from within the Bella Center. Thanks so much. That makes me happy that you have found something useful here. It’s why I did it, so I’m glad you could use it! Good to know it was worth the effort. Cheers! I love the way you write information about this subject. I wish you much success with your site. The information is certainly useful. As they say in Denmark, Mange Tak (many thanks). It is my intension to provide some useful info — so I’m glad my mission has been accomplished! All the best to you as well. Hay adminstrator , i like with ur web blog.